Let your students relive the first Thanksgiving with books, a movie, and fun, preschool activities this November. Help children compare pilgrim and Native American children’s lives to our society today. depicts the story of the Pilgrims' journey on the Mayflower and the hardships they face while on the ship. Once they arrive in America the story shows how the Indians help them plant corn, pick berries and catch fish to survive. The entire story is told through the eyes of a mouse named William. What a great way to introduce the first Thanksgiving to your classroom! Show children a map and the route the Mayflower took to reach Plymouth Rock. Let your little pilgrims set sail on a journey to America with a Mayflower mapping activity. Children will learn the oceans and continents while discovering the path the Pilgrims took to get to America. The teacher will print out the Mayflower and continents printable in the Bright Hub Education media gallery for each student. Show children a world map and name the continents and oceans. Instruct children to color and cut out their Mayflower and continents. Using the map, show children America and have them find their cutout of North America. Instruct them to glue it on the blue paper, which represents the ocean. Continue with all the continents. Children will glue all the continents except for Australia and Antarctica; they will draw these two on the blue paper. Walk around and make sure students are gluing the continents in the appropriate places on their map and drawing Australia and Antarctica in the proper places. The teacher will write the names of the oceans and continents on children's maps. Point out the Atlantic, Pacific, Arctic and Indian Oceans. Children will draw a line from Europe to Massachusetts while the teacher uses the big world map to trace the path with her finger. Students will then use their Mayflower picture to show the route the Pilgrims took from Europe to Massachusetts. 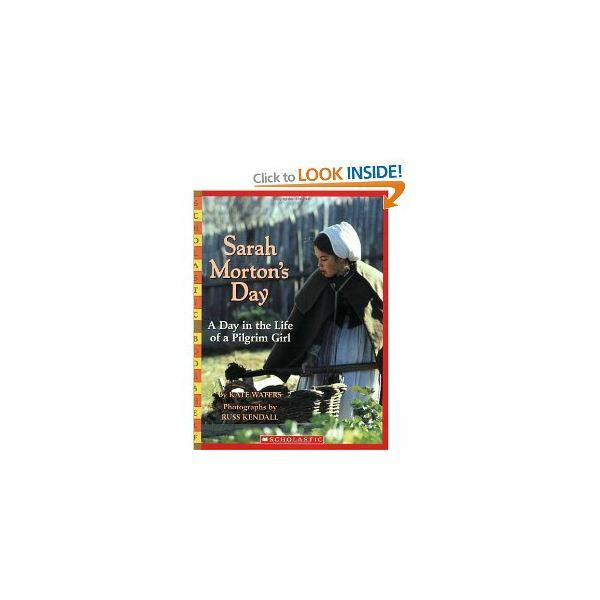 Read the books, “Sarah Morton's Day: A Day in the Life of a Pilgrim Girl," by Kate Water and “Samuel Eaton's Day: A Day in the Life of a Pilgrim Boy," by Kate Water. Discuss different chores and responsibilities the pilgrim boys and girls had. The Little Pilgrims song will help children learn some of the chores pilgrim children had to do. Children will stand in a circle, sing, and do the motions to the song. swept the floor, swept the floor. The little pilgrim girls swept the floor, all through the day. gathered the wood. The little pilgrim boys gathered the wood all through the day. Continue with girl verses: knead the bread, husked the corn and cooked the food, planted the corn etc. Boy verses: feed the hens, hoe the garden, pull the corn, catch the fish, etc. Little preschoolers will count their many blessings while making a placemat that lists things that they are thankful for. Ask parents to send a family photo to school with their child. Tell parents that the photo will be used in a craft. The teacher will write "I'm Thankful for," on the top of the construction paper. 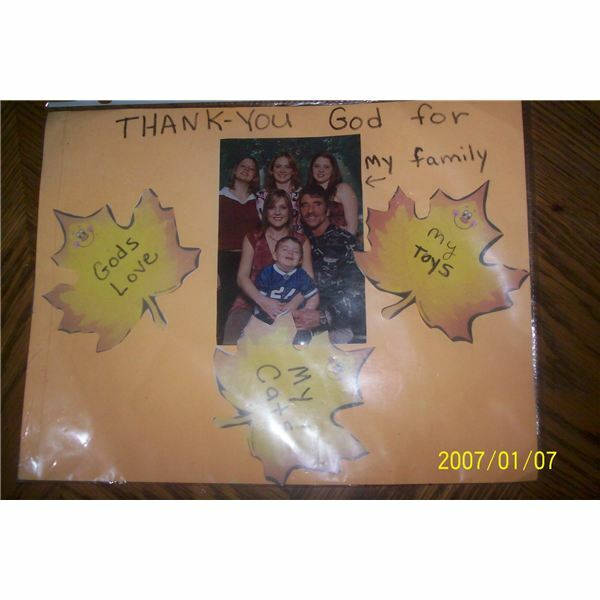 Children will glue their family photo in the center of the construction paper and glue the leaves or pumpkins around the photo. The teacher will walk around the room and ask each child what they are most thankful for and write it on their leaves or pumpkins. Slip the paper into a sleeve and tape shut. These beautiful place mats will remind children of their many blessings. Show pictures of a log cabin and longhouse. Explain to children that pilgrims and Indians had to build their own houses out of wood or tree bark. A pilgrim used logs to build cabins. Most cabins were not very big and would only house a small family. Indians built longhouses made of wood posts and poles and covered with sheets of tree bark. Longhouses were very long with the average being 100 feet and some as long as a football field. Longhouses were built to hold twenty or more families. After the discussion and comparison provide students with Lincoln Logs and Big Blocks and let them construct their own longhouses and log cabins. Children will better understand colonial life while comparing their own lives to that of a pilgrim child. Explain to preschoolers that pilgrims didn’t have grocery stores to buy food like we have. They had to grow their vegetables, hunt for meat or fish and find fruits and nuts on trees and bushes. The Indians taught the Pilgrims how to plant corn, squash and beans and showed them which wild berries were safe to eat and how to identify poisonous plants. Syrup from trees and possibly honey were the only sugars the Pilgrims had. Therefore, pumpkin pie and cranberry sauce were probably not on the menu. The foods the Indians and Pilgrims ate on that first Thanksgiving were much different from some of the dishes we eat today. Children wore different clothes and played with different toys. Find pictures of modern appliances, toys, vehicles and food that we have available to us today and pictures of items the Pilgrims had and the food they ate their first Thanksgiving and laminate them. Some picture cards are available in the media gallery. The teacher will print out the comparison cards located in the media gallery and possibly find several more modern and colonial comparison pictures and place them in a bag. Children will take turns picking a card and placing it on the colonial or modern home printable. Additional activities could include making your own homemade butter, making holiday gift baskets of food and toys for the needy in the area, or putting on a Thanksgiving play at a senior living center in the area. 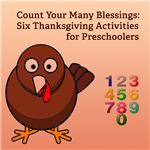 Your students will count their many blessings after participating in these fun, preschool Thanksgiving activities. There are so many wonderful games, stories and activities to teach preschoolers about the first Thanksgiving and how truly lucky all of us are to have all we have. The Mouse on the Mayflower. VHS. August 18, 1998. Water, Kate. Samuel Eaton's Day: A Day in the Life of a Pilgrim Boy. Scholastic. November 1, 1996. Water, Kate. 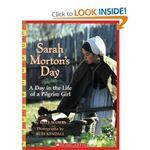 Sarah Morton's Day: A Day in the Life of a Pilgrim Girl. Scholastic. October 1, 1993. Lesson ideas, photo, song and craft courtesy of Lisa King, all rights reserved.